Viewer this is your part of this game. A simple description to still allow the experience to be new. When invited to the Chamber feel welcome to come along. The space you hold sacred around you will be respected, all that is asked from you is to exist at a moment with another force other than yourself. You are free to leave at anytime, until another is chosen. We are mirrors to each other. Come closer to the figure(s) that move under the light. Come see this moment as a landscape in which you hover over. See yourself in these/ this figure(s) as floating world(s), only now able to see the pale blue delicate soup that you are. Harmony easily broken with any influence dropped in. Decipher your roots. Five with frogs follow the figure(s), the rest follow the five. Five lead us all to the next experience when this ones complete. Severed moments of macrocosmic balance routinely underline human evolution. These moments intrigue, as modernity has alienated us from the immediacy of life. Perceptions of time become mercurial and subjective depending on perspective. 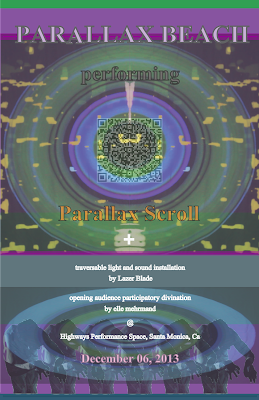 Parallax Scroll will take the audience on a revisit through the emergence of life. A trip that re-exams light, language, and the development of society, ending in a space unresolved and recycled. All points can viewed when wading on a Parallax Beach. PARALLAX BEACH's "Parallax Scroll" is a multi-media performance piece that bridges the abstract landscapes of sound, light, time, and movement. A collective of artists, each utilizing different mediums, come together to make this unique work. Wes Johansen creates a visual representation of abstract thought through digital video projection, edited live and synchronized to synthesizers. Mike Meanstreetz uses avant-garde percussion and composition techniques tangling the participants of this ritualistic performance in a web of synesthesia . These elements are accentuated as josie j conveys transformation to witnesses through ritualism/ meditative movement, influenced partly by Butoh training and a background in performance art. Also performing in this piece are Zachary Vidal (saxophone/sampled noise) providing textured mood, and Brennan Lowe (movement) setting the wheel of this cycle into motion. It has been a great privilege to have the opportunity to work with Brennan Lowe. Parallax Beach was and is the first venture into choreography for myself. Brennan has been very patient and a worthy aide and contemporary. Although Brennan has expressed his feelings of seeing me as a mentor, I have learned a lot from Brennan. He has and always challenges me and pushes my view on art and art process. Because of this I am excited to share with you, fellow viewer, his solo performance. Performer/ Performance Artist/ Installation Artist Brennan Lowe, also known as Parallax Beach's other performer/ dancer will be having a solo performance at Highways Performance Space this Saturday. Come and support this very gifted young artist before he goes back to the east coast to finish his BFA. Traveling through absurd environments and alternate states of consciousness, Volatile is a multi-media installation and performance about the fragility of sanity and the contextual relativity of identity. Referencing determinism and questioning the existence of free will, both the visceral and conceptual components of cognitive processes are pursued. were fun. Three cute boys making noise, much fun. Without further a due here are some stills of the night. Brennan has got his character and moment down. Stay tune for some audio. Coming off the Epic Highways show, Parallax Beach is excited to present a much more appropriate, raw and dirty version of "Parallax Scroll". We are honored to be performing at one of the last nights of Sean Carnage's influential Monday Nights in this City of Angels. This show is poignant not only because of this, but because it will be the last time we will be performing "Parallax Scroll". With the monumental departure of Brennan Lowe from the troupe we will move on to a new piece. Excited to invite you to PARALAX BEACH's debut of "Parallax Scroll". divined of haunting sing-song and movement, foreshadowing what is to come. Passing through the theater's entry way, the night's performances will be initiated both spatial and temporally by a traversable light and sound installation by the artist Lazer Blade. This year has been a very eventful year. Many performances and many artwork has yet to be made, but the opportunities I have had this year I have been grateful for. I have lost my mailing list do to my computer failure but hopefully new social media will add in communication. Also the few die hard fans can always keep up to date here and on the events page. Any yes the new computer is on its way... finally. More shows coming this month (more DBRP performances), in November (as part of the La Pocha Nostra Workshop at Highways) in December (Parallax Beach Debut of Parallax Scroll 2.0 At Highways). List of events HERE. This Past weekend Parallax Beach had an opportunity to run though the beginnings of Parallax Scroll in marathon form. Five 45 min performances in a four hour block. we finished exhausted, cleansed and accomplished. Here are a few snippets of the performances. Parallax Scroll is a multi-media performance piece that bridges the abstract landscapes of sound, light, time, and movement. A trio of artists, each utilizing different mediums, come together to make a unique piece. Wes Johansen creates a visual representation of abstract thought through digital video projection, with live editing and synchronizing directly to the soundtrack. Mike Meanstreetz uses avant-garde percussion and composition techniques tangling the audience in a web of Synthesia. These elements are accentuated as josie j conveys transformation to audience through ritualism/ meditative movement influenced partly by Butoh training and a background in performance art. With additional assistance from Zachary Vidal (audio) and Brennan Lowe (movement). Parallax Beach will be performing Parallax Scroll on October 5, 2013 as part of Soundwalk in Long Beach CA. ● WHAT: A multi-media performance piece Parallax Scroll, performed as part of the 10th annual “SoundWalk 2013” festival, a one-night event of installations by 40 local and international sound artists. ● WHERE: Artwise 408 1 st. st. and throughout the area encompassed by 4th St, Linden Ave, 1st St, and Elm Ave.
● PARKING: Metered parking is available on the street; additional parking is also available in the parking lot at the NW corner of Broadway and Elm Ave.